MRI doctor stools are non-magnetic for use directly in the MR suite. These MRI stools are available in many configurations. Choose between burgundy or green upholstery. 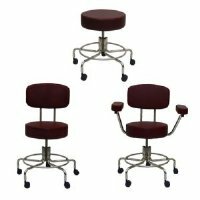 The non-magnetic chairs are available with or without casters, with optional back, or with optional arms. We also provide the option to have the stool custom stenciled on the back. The MRI doctor stools also are available in two different adjustable heights to fit your needs. Safe for use directly in your MRI room.